Haley's Staff Picks featured at Book Culture on Columbus! This is one of those books that I noticed is blowing up so I figured I'd move this towards the top of the reading list and I wasn't disappointed. This is the first magic-themed book I've read that I couldn't connect to Harry Potter in any way (which is truly impressive because fantasy has really changed with HP, in my opinion). This is a dark story about a magician who can travel between different worlds by the power of blood. Kell is tricked and given a mysterious package that turns out to be a huge threat to all three travel-able London's and it seems to have come directly from the (presumably) destroyed Black London. The plot is a little obvious at some points but there are some others were you sit straight up out of shock. I have touched very little Sci-Fi and this is an excellent start if you're on that same boat. The premise: a world where there are four Londons, each with varying levels of magic in them. Our hero Kell is one of very few who can travel between all four. What follows is an utter blast to read, full of characters you will love, and love to hate. 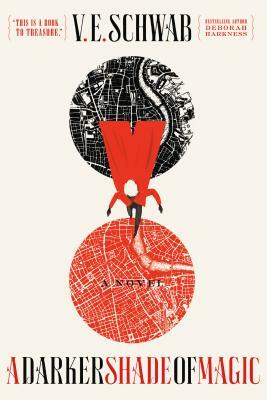 Once you read this, be prepared to read absolutely everything else V. E. Schwab writes for the rest of time. Kell is one of the last Antari—magicians with a rare, coveted ability to travel between parallel Londons; Red, Grey, White, and, once upon a time, Black. Kell was raised in Arnes—Red London—and officially serves the Maresh Empire as an ambassador, traveling between the frequent bloody regime changes in White London and the court of George III in the dullest of Londons, the one without any magic left to see. Unofficially, Kell is a smuggler, servicing people willing to pay for even the smallest glimpses of a world they'll never see. It's a defiant hobby with dangerous consequences, which Kell is now seeing firsthand. After an exchange goes awry, Kell escapes to Grey London and runs into Delilah Bard, a cut-purse with lofty aspirations. She first robs him, then saves him from a deadly enemy, and finally forces Kell to spirit her to another world for a proper adventure. Now perilous magic is afoot, and treachery lurks at every turn. To save all of the worlds, they'll first need to stay alive. V. E. Schwab is the author of the New York Times-bestselling Shades of Magic series, as well as The Near Witch, The Archived, and Vicious. The product of a British mother, a Beverly Hills father, and a southern upbringing, Schwab has a penchant for tea and BBC shows, and a serious and well-documented case of wanderlust.